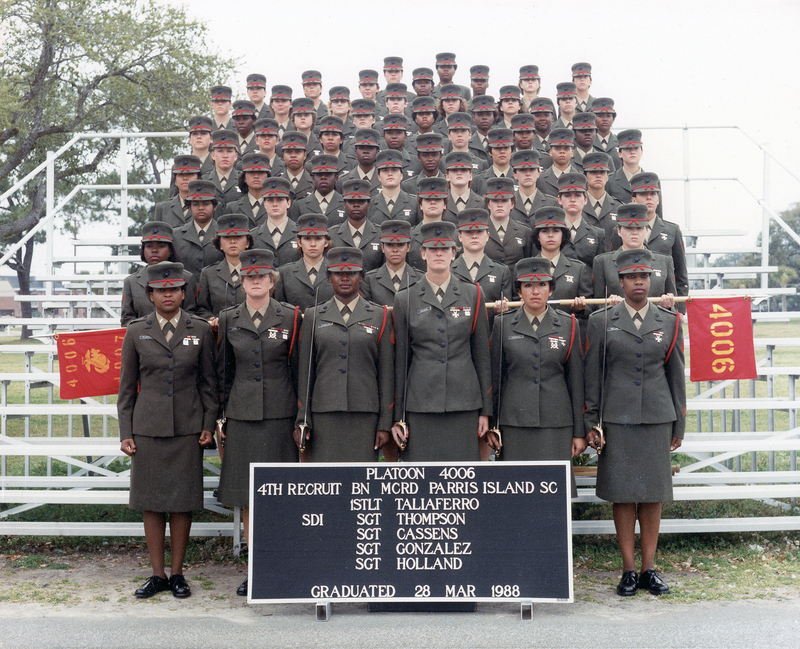 This is my platoon in 1988 at Marine Corps Recruit Depot Parris Island, S.C. I, Pvt. Sharyn Flanagan, am the first one on the left in the second row from the bottom, holding a guidon. We started Jan. 14, 1988. On Nov. 10, 1775, the United States Marine Corps was founded in Philadelphia. So as a native Philadelphian, it seems very appropriate for me to join the Marines. Well … I love a challenge. Don’t tell me I can’t do something because I’ll try to prove you wrong. I wasn’t doing well in school and I knew that my parents were going to totally flip when they saw my horrible grades. At that point I had already decided not to become a teaching nun (Shut up! Yes, a nun!). I had pledged Zeta Phi Beta and gotten all wrapped up in the social scene. I had a work-study job, Greek Council meetings, WCU Forensics and Pi Kappa Delta speech competitions, Residence Hall Association events, The Quad (college newspaper) and WCUR (radio station). I was also a “model minority” and part of a team that traveled around Pennsylvania making speeches and helping to recruit other minorities for the state school system. Who had time for school work? The recruiters set up a few of us at a downtown Philly hotel during Penn Relay weekend to take our physicals and the ASVAB (Armed Services Vocational Aptitude Battery) test at the MEP (Military Entrance Processing) station that used to be on Broad Street. It was actually fun, I got to meet a few people who were there for the Relays and plenty of other recruits from the region. After the written test and a very long physical exam, we waited for what seemed like forever. I figured I had made it to the physical so all I needed to know was what occupation I had tested into. But instead myself and at least two others were separated from the rest of the large group of recruits. When the Marine reps took me into a room to talk to me they said I didn’t pass the physical because I was too short and underweight. I was upset that they had brought me there when they knew my height and weight before I even got there, so how could they deny me the opportunity to continue this journey? They said they had to make sure I had no criminal or drug history and maybe I could qualify for a height and weight waiver. All of the sudden, joining the Marines was all I ever wanted to do. A month before that it wasn’t even on my radar. That’s the draw of this elite branch of the military. I was able to get the waiver and I went into the DEP (Delayed Entry Program), which gave me a retroactive join date even though I didn’t go to boot camp until January 1988. That entry date and my accrued college credits enabled me to be pinned a private first class upon graduation from boot camp. So I was heading to Parris Island, S.C., and just for the record, male Marine recruits from west of the Mississippi River go to Marine Recruit Depot San Diego in California and all others go to South Carolina. All female Marine recruits go to Parris Island. So if you meet someone in a bar bragging about being a Marine, you can usually smoke out the posers by asking where they went to boot camp. Anyway… my flight from Philly to South Carolina was the first time I had ever been on a plane, so some of the other recruits recommended that we go to a bar at Philadelphia International Airport and get some drinks. Arriving right before reveille at zero-dark-30 with alcohol in our systems at Marine Corps Recruit Depot Parris Island WAS NOT a bright idea. 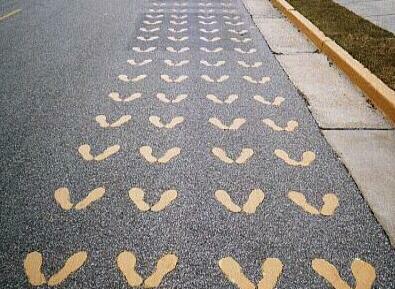 Upon arriving, recruits are greeted by a drill instructor and ordered to get off the bus and onto Parris Island’s legendary yellow footprints. It all looked innocent enough at first, cute little yellow footprints for us to stand on upon arrival. The drill instructors seemed so patient during this “forming” phase. We did paperwork, got all of our uniforms, equipment, training books and a ton of supplies and toiletries. We didn’t know that we hadn’t met the drill instructors who would “mold” us. Those beginning days were definitely a honeymoon phase. There’s plenty that goes into making Marines: the daily physical training (PT), drilling precision, swim qualification, rifle qualification, grenade throwing, gas chamber and The Crucible. My class was the first group of women to go through Basic Warrior Training (BWT). Our drill instructors told us that this was all new to them too and for us to be patient with them. They said it would be hard being the first women to go through it and that there may be cameras around us documenting our training. Then they made us a promise: no matter what you’ll get eight hours of sleep every day. I thought after doing so many all-nighters in college, who needs that much sleep a night? After a couple of tough days of warrior training the drill instructors said we would be allowed to have two “treat days” because we weren’t always able to get our eight hours of sleep. So one day we got to break into the goodies stash from the prohibited stuff sent to us in the mail from loved ones. And then on another day we got to go to the movies on base and we saw Suspect with Cher and Dennis Quaid. Some other memories stand out like during one of the weigh-ins, Drill Instructor Sgt. Cassens was measuring me and announced me as being 4-foot-9. I kept barking “No ma’am” to her bewilderment and refused to move from the scale until she restated my height as 4-foot-9.5. She got into my face and lowly queried, “YOU’RE going to argue with ME over half-an-inch?” And I loudly and proudly barked, “Yes ma’am.” She laughed and shook her head. Then regained her military composure and yelled, “Get out of my sight Flanagan.” I had already been dubbed the smallest recruit on the island at that point, I was fighting for that half-an-inch. Then on another day after a particularly grueling workout on the beach in which we were all puking and sweating and crying for our Mommies, Sgt. Cassens called me to the front of my platoon and said, “This Marine has more heart in her pinky than most of you have in your entire bodies!” I loved going through that chow hall to get my double rations (they tried to fatten me up) and hearing the chow hall privates say to each of us every day “Stay motivated private, stay motivated.” I didn’t care that I had to carry a 90-pound pack on my 85-pound body on a 5-mile trek to our camp site or how many times I had to go through swim qual or rifle qual. I was going to make it and I was going to be the best! No marksman pizza box badge for me, I had to be at least a sharpshooter. Also, we learned that the easiest way off that island was to graduate. If you decided to drop out you didn’t get to go straight home, you had to work on the base to reimburse the Marines for what they had already invested in you. We heard that former recruits ended up staying on the island weeks longer than the platoons that they dropped out of. So it wasn’t worth quitting. Platoon 4006 really bonded and we knew we would miss each other after graduation. A few of us were slated to have training in the same place, but most of us were going to be separated. We would have the warm recollections of us singing the Lord’s Prayer (Our Father) in two-part harmony out in the field around a huge fire during war games and eating MREs and crackers from the chow hall behind our bed frames like we were starving or something. Also we would remember standing at attention for what seemed like hours for inspections and drilling on the quarterdeck with our rifles and really becoming one with our M-16A2s. I remember us writing a song for our drill instructors before graduation called In the Marine Corps to the tune of Lisa Lisa & Cult Jam’s Lost in Emotion. No matter what, even through many Marine Corps scandals in the news, I have no regrets. It’s one of the best things I’ve ever done with my life. I learned a new appreciation for what I had and how blessed I was. I graduated from boot camp and then refocused myself on my college studies. Something that many of the women wished they could’ve done without the military’s assistance. One fellow Marine showed off pictures of her log cabin home down South and her two little girls. She said all she every wanted was to provide for them and joining the Marines was the only way she could do that. I was a spoiled brat going to college with minimal financial aid and my parents paying for almost everything. After finishing boot camp in March 1988, I got a little break back home in Philly. My parents threw me a party and all I heard around the house that day was: “I never thought she’d make it,” “She’s just so tiny,” “Did you see her on TV with her rifle?” Many thought that I was crazy to go through three months of training to join the Marine Reserves and not go active duty, but that’s what I wanted so that I could finish college and maybe go to Officer Candidate School. 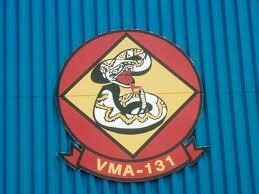 I went on to train as a 6046 (aircraft maintenance administration clerk) at Naval Air Station Meridian in Mississippi. I was later stationed at Marine Corps Air Station El Toro in Santa Ana, Calif. After a little over a year there, I moved back to Pennsylvania and was stationed at Naval Air Station Joint Reserve Base Willow Grove. And it wasn’t all just about PT, training for gas attacks, rifle qual, inspections and fixing aircraft either. My Reserve units went out into the community with Toys for Tots drives and we even did community cleanups. I left the Reserves in 1995, but had to be on the call-up rolls until 1996. I received Marine of the Quarter a couple of times, a National Defense Service Medal for serving during the Gulf War and two service stripes to represent my eight years in the Marines. The Marines taught me a great deal and I will always cherish it and ALWAYS be a proud Marine! Happy birthday Marine Corps and happy Veterans Day to all of my military colleagues! 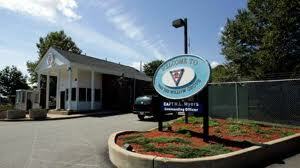 NAS Joint Reserve Base Willow Grove was closed in 2011 and the Pennsylvania Air National Guard will take most of it over. 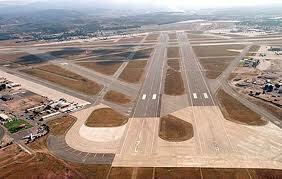 MCAS El Toro seen from the air. It was called a “model installation” with its $27.2 million aircraft-simulation facility. The air station officially closed in 1999. My unit at NAS Willow Grove in Pennsylvania. This air station was shut down in 2011 with the Pennsylvania Air National Guard set to take it over. 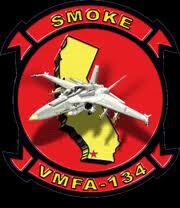 My unit at MCAS El Toro in Santa Ana, Calif. Between both the bases I served at I got to work on CH-53s, CH-46s, A-4s, A-6s and FA-18s. Tags: basic warrior training, birthday, boot camp, DigiWriMo, Marine, Military, NaBloPoMo, Parris Island, Philadelphia, Semper fidelis, Tun Tavern, United States Marine Corps, veterans, women Marines. Bookmark the permalink. Awww, you’re just the coolest jarhead I’ve ever met!!! Thanks Bill! You’re pretty cool too! HI NAME IS kASSANDRA l cummings I JOINED THE US MARINES CORPS JUNE 1997-2003 I ENJOYED BEEN A FORMER MARINE Staff Sergeant Kassandra Lectrice cummings smperfi my was 4006 oscar company 4th recruit training battlion i graduated on june 18,1997 parris Island recruit deport .